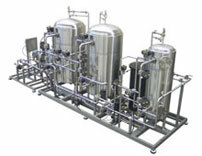 Facility Utility Pure Steam | Package | Protocol | Pitot & Exp Tubes. Facility Utility Pure steam validation, an Introduction. The testing involved in Facility Utility pure steam validation requires a continuous supply of saturated steam; preferably sourced from the actual line that supplies your sterilization systems. Too high a level of non condensible gases will prevent the attainment of sterilization; too little moisture carried in suspension may allow the steam to become super-heated during expansion into the chamber, while excess moisture may cause damp loads. Where steam systems are either routinely or irregularly shut down, large quantities of air will be present in the distribution system on restarting. It is recommended that in such circumstances a comprehensive and validated venting procedure should be applied and testing steam quality should be routinely executed. Combined IQ/OQ/PQ Protocol for Testing Steam Quality. The facility utility pure steam validation protocol is a very detailed and comprehensively scripted protocol. All the test scripts required for IQ/OQ/PQ execution are in place ready for editing to represent your installation exactly. Tests scripts are very detailed and all calculations are broken down into simple stages. Illustrated equipment hook up diagrams and sequential instructions further ensure that this testing is easily within the skills of the average technician. The power of steam to sterilize is very closely linked to the characteristics of that steam. Routine facility utility pure steam validation of your steam quality must be carried out to ensure that your sterilization processes are never compromised. Annual testing of steam automatically attracts auditor attention. Steam quality must be re-verified when ever any changes or disturbances affect a qualified quality steam system. SOP for GMP Testing Steam Quality (SOP-QST). This is a fully documented and detailed SOP that you will use every time you execute your periodic facility utility pure steam validation of your quality steam system(s). Tests scripts are very detailed and all calculations are broken down into simple stages. Illustrated equipment hook up diagrams and sequential instructions further ensure that this testing is easily within the skills of the average technician. The main reason companies have not executed steam quality testing in-house; was that the hardware (pitot and expansion tubes) were extremely difficult to source. This induced us into having these manufactured for our own use manufactured and offer them for sale on this site. All other test equipment required is readily available in most laboratories (tubing, glassware and multi-meter). Wet steam is undesirable as it has less energy than dry steam and more importantly can cause wet loads. The packaging used for sterile products prevents reinfection when dry, but its bacterial retentive properties will be adversely affected by the presence of moisture. Wet loads can be considered to be un-sterile. The dryness fraction describes how dry steam is, with a value of 1 representing steam that is 100% dry, and therefore free of entrained moisture. Steam with a dryness fraction of 0.99 consists of 99% steam and 1% water. If we measure the latent heat present in steam that has a dryness fraction of 0.99 we will find that it possesses 99% of the full quotient of latent heat. The draw back to carrying out in-house facility utility pure steam validation has always been the lack of the correct Pitot and Expansion Tubes, along with difficulty of generating a quality protocol for qualification purposes. Now these excuses are gone, a quantity of the tubes have been manufactured to a tried and tested design, and are now in stock. The Testing Steam Quality protocol is also available for direct download. This document is not a template, it is a finished document. There is a prefixed SOP which will auto populate the document for you, with your company’s names and addresses, other than that the document is ready to execute. This is a fully documented and detailed SOP that you will use every time you execute your periodic re-qualification of your quality steam system(s) Tests scripts are very detailed and all calculations are broken down into simple stages Illustrated equipment hook up diagrams and sequential instructions further ensure that this testing is easily within the skills of the average technician. The main reason people have traditionally contracted steam-quality-testing-out, was that the hardware (pitot and expansion tubes) were extremely difficult to obtain. We have had these manufactured for our own use and include them in this offer. All other test equipment required is readily available in most laboratories (tubing, glassware and multi-meter). Price of kit includes expansion and pitot tubes. This is a very detailed and comprehensively scripted protocol. All the test scripts required for IQ/OQ/PQ execution are in place ready for editing to represent your installation exactly. Tests scripts are very detailed and all calculations are broken down into simple stages. Illustrated equipment hook up diagrams and sequential instructions further ensure that this testing is easily within the skills of the average technician. All sterilization tasks using steam attract the attention of the regulators. There are often serious problems that inhibit or reduce the sterilizing efficacy of steam that remain obscure to the operator and only become apparent to the end user. This a high quality protocol listing all component parts that required for setting up and executing of the three main steam quality tests. All the operator has to do is use the auto fill function to personalize the PQ, then follow through the detailed test methods recording the results as they go.